I've had less time to write lately, which I suppose is a good thing in a way. What happens though is I start writing and quickly find myself short on time, and the result is that I'm now sitting with a whole bunch of "stubs" of posts that I never published because they're unfinished. And what good is that? So... My thought is that I should put out more "stubby" posts - short ones, thoughts I have on this or that, even if they're raw, incomplete, less polished - and we'll see how that goes. To kick this off, I wanted to mention a brief conversation I had with my son yesterday. He started singing a Rebbe Nachman song he heard at school, which contained themes to the effect that Rebbe Nachman will "save" you, that Uman is an "ir hakodesh" (holy city), and that we look forward to the day when Eliyahu Hanavi comes and Rebbe Nachman "returns". To be clear, he was singing it in humor. I asked him why he came home early, and he explained that one of the teachers at his school is a Breslover Chasid and flew to Uman to be "by the rebbe" for Rosh Chodesh Nisan. It would be really easy to say, "This is totally crazy." But the truth is, there are a lot of crazy beliefs in Judaism. Is the belief that Rebbe Nachman will save us so much crazier than the belief that the Sea split? Not really. But the difference is that the Sea splitting is written in the Torah itself, and it's a fixture in our mesorah (tradition). So even though it's a crazy thing to believe, we accept it as a part of our tradition, and we deal with it - think about it and interpret it - however we choose to do that. Whereas the Rebbe Nachman craziness is hardly a "fixture" in the tradition. So why add more craziness to Judaism? Like all such conversations, I'm sure I could've put it differently, maybe better. But what I liked about it was that I was able to "give over" the idea that there are concepts in the tradition which don't make sense rationally, and that it's OK to recognize that (as opposed to defending them as rational), and it's OK as a thinking person to allow such a thing to exist as a part of Judaism. And he was able to hear that. And that's basically my whole approach to Judaism: Be real and honest about the tradition, and at the same time find ways to enjoy it, to appreciate it, and to make it meaningful. Much agreed about stubs, but they will leave open questions. Are you talking about Rebbe Nachman of Breslov, who died in 1810? If so, what is the "thing" you're talking about? Depending on what the "craziness" is, it may or may not be an appropriately Jewish kind of "craziness." We have a Jewish tradition that G-d intervenes in history -- whether seas are split or a thousands-year old exile ends as a result of this intervention doesn't much matter from this perspective. But we also have a Jewish tradition that limits the veneration of human beings, living or dead. Yes, and the "thing" I'm talking about is "Breslov" - the Rebbe Nachman movement. It's a bit like Chabad in that it's a whole inner circle of people worldwide who are into "the (dead) Rebbe" and quasi-worship him as a messianic/magical figure, name their kids after him or his disciples, make pilgrimages to special "holy sites", spend most (or at least a sizable chunk) of their Torah learning and devar Torahs talking about the Rebbe's teachings, have half their library dedicated to that literature, hang out and daven with one another, etc. People identify as "Breslovers" (or "Na-nachs") and really do have their own "thing" just like any subgroup within Judaism. To be sure, there are other criticisms to be leveled about the Breslov movement (similar to Chabad), not a small one being the human veneration point. After all, we don't have "Rebbe Akiva" worshipers - although his student Rabbi Shimon bar Yochai has become something of a venerable veneration object. The common thread which serves as the foundation for this kind of thinking seems to be the kabbalistic/mystical school of thought. News to me! Personally, I find this crazier than sea-splitting, because it seems to go to the heart of what it means to seek forgiveness in a Jewish way. 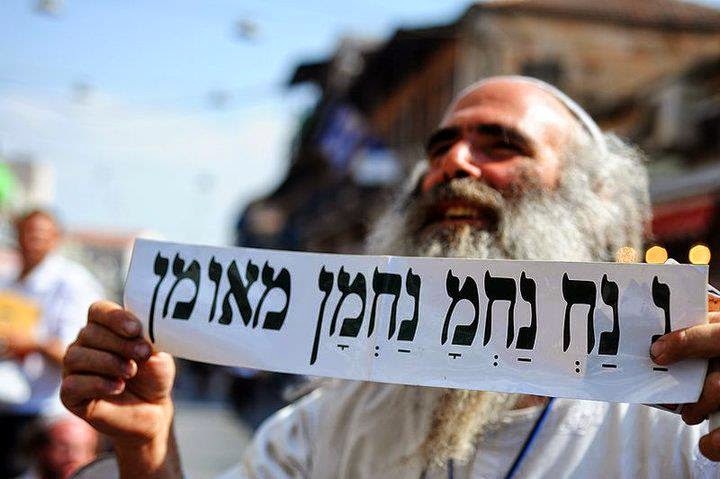 I found this on one of the Na-Nach sites online: "Na Nach Nachmu Nachman MeUman – this is the main point. This contains all of the Redemption, and all of the salvations are included in this name, for the central point of everything is dependent on Rabbi Nachman." Um ... this seems to go beyond crazy, to embrace a kind of abracadabra magic that doesn't seem Jewish to me. Then again, I know nothing about this movement, so I don't mean to judge. My guess is that the reason it doesn't seem Jewish is that you haven't had enough exposure to Kabbalistically-inclined communities, where the idea of manipulation of spiritual forces through one's words and actions is taken very seriously. But the truth is it starts in the Torah itself. Throughout the tradition there's acknowledgement that magic and witchcraft exist, although it's referred to as an "impure" force to call upon, something forbidden to use. Kabbalah is in a sense "kosher magic". Just like you have idolatrous sacrifices and sanctioned sacrifices, there's a "wrong" way to manipulate the supernatural and a "right" way. The right way says that Hashem gave us a specific way to do it, which we must use very carefully, and the wrong way is to divorce Hashem from the process and use "outside" techniques. The right way is to use names of Hashem and other "in-lingo", and the wrong way is to use terminology like "Abracadabra" or "Expelliarmus". Really the difference between Kabbalists and mainstream frum folks is that the latter look at "Kabbalah ma'asit" (practical Kabbalah) as something which requires so much expertise that it's dangerous to fool around with unless you're one of the spiritual giants of the generation.